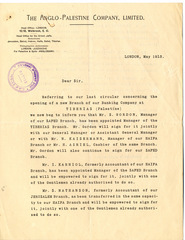 Description: The circular letter announces the opening of a new branch of the banking company in Tiberias, Palestine. The letter also refers to the bank manager of the Safed branch, the Haifa branch and the Jerusalem branch. Isaac Leib Goldberg, an early Zionist leader in Vilna at the turn of the 20th century, was active in Zionist organizations and in various industrial ventures in Palestine.